Put into a clean plastic bag; flour, salt, oregano, and lemon pepper. Add scallops to the flour mixture and toss until lightly coated on all sides. Remove the scallops from the bag and put them onto a plate. Heat 2 Tablespoons of the olive oil in a frying pan over high heat. Using a pair of tongs, shake off excess flour before adding the scallops to the pan. Add half of the scallops to the pan and sear on both sides (about 2 minutes for each side). Remove scallops from pan and place on a plate. Repeat cooking process with remaining scallops. Toss with parsley and lemon juice. I want to marry this cooking lady. Hey Joe! Sweet offer but I’m already taken! THIS is what the internet should be used for!!! I usually grill them and I substitute cilantro for parsley but I never tried dredging with flour before. Good job! FYI, dried chipotle with garlic makes a great substitute if you are feeling texmex festive. Great production Kathy, you have raised the bar!!!! Perfect timing! I visited your website today, planning to search for info on cooking scallops! You must have read my mind! I like your scallops recipe. Can you suggest what side dish I can pair with this? Very informative website. The cooking videos are very high quality (both sound and resolution). I am a newbie, learned a lot thru your website. Rice or couscous goes really well with scallops. Any and all green vegetables including asparagus, green beans, or broccoli, make for a great side dish. Good luck developing your cooking skills! 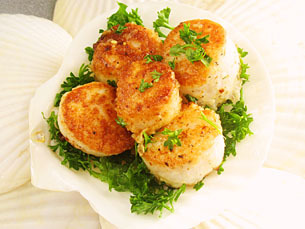 Scallops are delicious and can be cooked in minutes! They are perfect when you have no time to cook. You just have to follow a few simple steps and you’ll be ready to eat a tasty, zesty meal!